The Premier League’s 41-goal Saturday was a record for the 20-team division, but other intriguing stats can be found in two specific score lines: Everton’s 5-3 win over Blackpool, and Newcastle’s 4-4 draw with Arsenal. This was the first time in the Premier League that both these eight-goal thriller scores have been recorded on the same day. 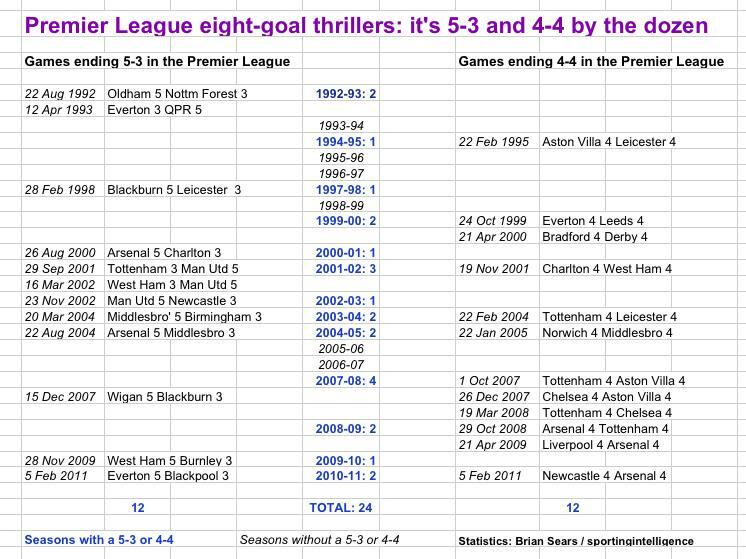 And thrillingly, for a statistician, it was the 12th time that each of those score lines have happened in the 19 Premier League seasons; so it’s now 5-3 and 4-4 to the dozen, literally. We list all the 5-3s and 4-4s below to evoke fond memories, at least for some. Six of the 18 completed seasons did not feature any instance of 5-3 or 4-4, while the 2007-08 season had as many as four. On 28 other occasions, Premier League games have registered eight goals but in more runaway matches: 8-0 (twice), 7-1 (12 times) and 6-2 (14 times). So that’s 52 eight-goal games out of a total of 7,360 Premier League games played so far, averaging an eight-goal game once every 142 matches, or just over seven times in every 1,000 games. To complete the high scoring picture, nine goals have been scored in 10 games, 10 goals twice and 11 goals once. For the record that was Portsmouth 7 Reading 4 on 29 September 2007. One club, Manchester United, has figured in 5-3 results three times (all won), while five clubs have been involved twice (Arsenal won both, and Everton, Blackburn, West Ham and Middlesbrough have each won one and lost one). When it comes to 4-4 draws, Arsenal have featured in all of the most recent three. Aston Villa have also played in a total of three, but Tottenham take the biscuit, having shared eight goals in as many as four games, all in the last eight seasons.